Allergy Advice: Contains Soybean, Wheat Gluten. 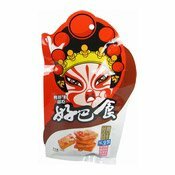 Ingredients: Spicy Flavour: Soybean (Soy) (60%), Water, Soybean Oil (4.5%), Chilli (1.8%), Salt, Flavour Enhancer (E621), Sichuan Peppercorn (0.35%), Flavouring, Soy Sauce (Soybean, Water, Salt, Wheat Flour (Gluten), Colour (E150a)), Brown Sugar, Spice, Flavour Enhancer (E635), Preservative (E262), Firming Agent (E511). Pickled Chilli Flavour: Soybean (Soy) (60%), Water, Soybean Oil (4%), Pickled Chilli (1.4%), Salt, Flavour Enhancer (E621), Pickled Ginger, Flavouring, Soy Sauce (Soybean, Water, Salt, Wheat Flour (Gluten), Colour (E150a)), Brown Sugar, Spice, Flavour Enhancer (E635), Preservative (E262), Firming Agent (E511). Five Spice Flavour: Soybean (Soy) (60%), Water, Soybean Oil (4%), Salt, Flavour Enhancer (E621), Flavouring, Soy Sauce (Soybean, Water, Salt, Wheat Flour (Gluten), Colour (E150a)), Brown Sugar, Spice (0.05%), Flavour Enhancer (E635), Preservative (E262), Firming Agent (E511). Barbecue Flavour: Soybean (Soy) (60%), Water, Soybean Oil (4%), Salt, Chilli, Flavour Enhancer (E621), Cumin, Flavouring, Soy Sauce (Soybean, Water, Salt, Wheat Flour (Gluten), Colour (E150a)), Brown Sugar, Spice, Flavour Enhancer (E635), Preservative (E262), Firming Agent (E511).